New York State Assembly Speaker Sheldon Silver was arrested Thursday on federal corruption charges and is accused of using his position in the state legislature to collect millions of dollars in bribes and kickbacks, according to a criminal complaint. Silver, who has held office in the State Assembly since 1976 and been speaker of the legislative body since 1994, turned himself into the FBI at its field office near Foley Square Thursday morning. The embattled legislator told reporters after his court appearance that he did not plan to resign. "I will be vindicated," he said. U.S. Attorney Preet Bharara accused New York State Assembly Speaker Sheldon Silver of cleverly finding ways to monetize his public office in violation of federal law in a scathing indictment of the longtime politician following his arrest on corruption charges. His attorneys, Joel Cohen and Steven Molo, released a joint statement calling the allegations baseless. 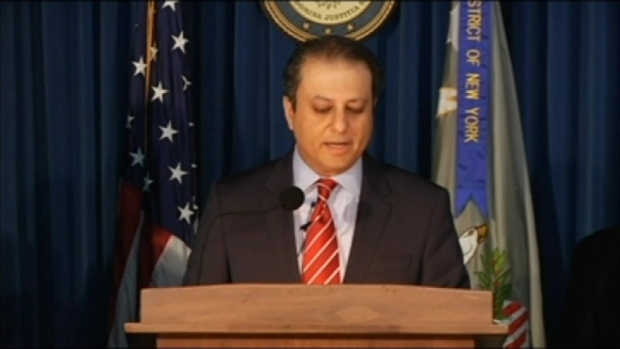 At a news briefing shortly after Silver's arrest, U.S. Attorney Preet Bharara accused the longtime politician of duping taxpayers through a series of secretive schemes and backroom dealings to line his own pockets, and "cleverly" seeking ways to monetize his public office in violation of federal law. Silver allegedly collected around $4 million in bribes and kickbacks and used his law license and lax New York disclosure laws to disguise the profits as referral fees, Bharara said. Those alleged ill-gotten gains accounted for two-thirds of the speaker's outside income since 2002, the prosecutor added. Bharara said a judge issued warrants allowing authorities to seize $3.8 million Silver had dispersed in eight bank accounts at six different banks in alleged fraud proceeds. "For many years, New Yorkers have asked the question, 'How could Speaker Silver, one of the most powerful men in all of New York, earn millions of dollars in outside income without deeply compromising his ability to honestly service his constituents?'" Bharara said. "Today, we provide the answer. He didn't." Sheldon Silver has long been viewed as the most powerful player in Albany but on Thursday he said he won’t resign and won’t even step aside as speaker despite the charges against him. The news of Silver's arrest has renewed calls to clean up Albany. Melissa Russo reports. The five-count criminal complaint unsealed Thursday focuses on two alleged schemes by which Silver acquired millions -- attorney referral payments and alleged real estate kickbacks. One firm, identified by sources familiar with the investigation as Goldberg & Iryami, allegedly paid Silver about $700,000 over the course of about a decade in "undisclosed bribes and kickbacks" to get real estate developers in the state to do their business with the firm. One of the real estate developers, described in the court papers as "Developer 1," is Leonard Litwin of Glenwood Management, according to the sources. The sources said Litwin cooperated with investigators, as did law firm partner Jay Goldberg. The firm Weitz and Luxemberg also allegedly paid Silver about $5.3 million since 2002. About $1.4 million came from an annual salary, which the complaint alleges Silver received "based on his official position rather than any work he was expected to perform." "For many years New Yorkers have also asked the question, 'What exactly does Speaker Silver do to earn his substantial outside income?'" Bharara said. "Well, the head-scratching can come to an end on that score, too, because we answer that question today as well. He does nothing." The rest of the money came from attorney referral fees, with about $3 million coming by way of a scheme where Silver allegedly passed on asbestos cases from a New York doctor, identified by sources as Dr. Robert Taub, in exchange for secretly providing Taub access to $500,000 in state grants and research funds. Taub is the director of the Columbia University Mesothelioma Center. Investigators said Silver referred about 100 clients to the firm, but none of the asbestos clients or their family had ever had any contact with Silver at all, court papers said. Taub cooperated with investigators, sources said. Messages left with Goldberg, Litwin and Taub were not immediately returned. Despite making assurances that he represents "plain ordinary and simple people," investigators found no court records indicating that Silver ever made a single appearance in state or federal court. "The problem for Sheldon Silver was that he was neither a doctor nor an asbestos lawyer, so Silver did not have relevant legal or medical expertise, but what he did have was extraordinary power over state money that he had the ability to dole out quietly, even secretly," Bharara said. Bharara had been focusing on how state representatives earned and reported income after the Moreland Commission was shut down in Albany before completing its own examination of alleged wrongdoing in Albany. Bharara says that too was Silver's doing. "A deal was cut that cut off the commission's work to the great relief of Sheldon Silver, who furiously fought its subpoenas and urged the commission's early shutdown," he said. "Moreland was made to close its doors after only nine months, its work barely begun, and while litigation over those subpoenas about Sheldon Silver's outside income was still pending before a state judge." If convicted of all five counts in the complaint, Silver faces up to 100 years in prison. He did not enter a plea during a brief court appearance Thursday and was released on $200,000 bond. Silver surrendered his passport and was told he needs permission to travel anywhere outside New York, New Jersey and Washington, D.C.
Mayor de Blasio said New York should let the judicial process play out. "Although the charges announced today are very serious I want to note that I have always known Shelly Silver to be a man of integrity and he certainly has due process rights and I think it’s important that we let the judicial process play out here," the mayor said. Questions in the past have been raised about Silver’s outside income that supplement his part-time assembly work and he has always denied wrongdoing. In a statement Thursday, FBI Special Agent in Charge Richard Frankel said Silver took advantage of his "political pulpit" to reap unlawful rewards. "We hold our elected representatives to the highest standards and expect them to act in the best interest of their constituents," Frankel said. "In good faith, we trust they will do so while defending the fundamental tenets of the legal system. But as we are reminded today, those who make the laws don’t have the right to break the laws." 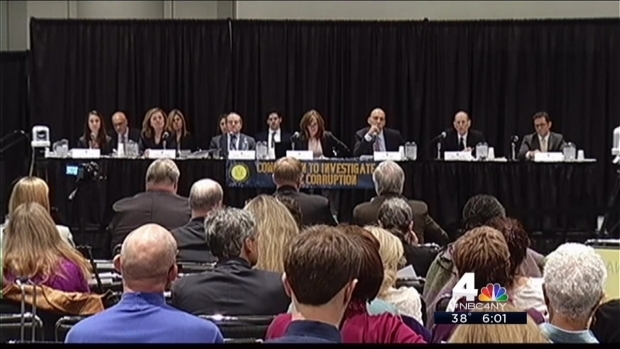 Albany has had its fair share of corruption scandals over the years. The last legislative leader to be charged was former State Senate Majority Leader Joseph Bruno. Bruno, a Republican, was acquitted last year after fighting two federal corruption counts for much of the last decade. Bharara’s office is prosecuting Democratic state Sen. Malcolm Smith in an alleged scheme to bribe his way to run for mayor as a Republican, and has charged numerous other current and former state and local politicians including State Sens. Vincent Leibell, Hiram Monserrate and Carl Kruger and New York City councilman Larry Seabrook.